Inside: A simple and easy moist banana bread recipe that will make your family think you have turned into a domestic goddess. It is light, fluffy, moist and oh so incredibly delicious. Just the smell coming from the oven is enough to drive you crazy for it. My head want’s chocolate, it always wants chocolate, it’s the biggest weakness I have. Every time I glance at the array of cakes in a bakery, my eyes are ALWAYS drawn to the sticky chocolate treat like this fudge recipe. If it has chocolate in it then it just seems to have my name written all over it. But let me tell you this taste buds….you are missing out on a whole lot of fun if you simply stick to chocolate. You might not think it at the time, but it’s true….broaden the horizons we must. I’m not necessarily saying that I’m not going to buy those delicious chocolate cakes when standing in that bakery, but at least when I’m at home I can try and be adventurous. The Banana Bread Recipe That Even Non Bakers Can Bake! But then we have my problem in the kitchen. I am NOT a baker. Not by any stretch of the imagination. I like my sweet treats delivered to me in an instant, no waiting and certainly as least preparation as possible. Call me lazy, call me impatient, either way, baking and me are not the greatest of friends. So when I tell you that this easy moist banana bread recipe is quick and simple to make….you can trust me on it! It is the most light, fluffy and moist banana bread ever and oh so incredibly delicious, I’m pretty sure you get the picture! So if I HAVE to stray from my chocolate obsession, this is a pretty good bet to run with. I was incredibly tempted to put chocolate chips in it too, but I did manage to resist it on this one occasion, but there are no promises for next time. If however the temptation for adding chocolate chips is far too great, then it’s easily done and will still taste amazing. You could however also spread some Nutella on the top of the banana bread instead of butter. Oh…now we are talking! So for those of you like me that LOVE your cake, but have either little patience in the kitchen or you just are simply not a fan of baking (which there is absolutely no shame in by the way), this IS the easy moist banana bread recipe that you need in your life. Start baking this one and the family are going to think you have found a new love in the kitchen. The kids and hubby will love coming home to the freshly baked smell of banana bread wafting from the kitchen and it is the prefect way to have all those domestic goddess fantasies come true. Well, no promises on the domestic goddess fantasies, but at least it’s a pretty good start. At the end of the day, it’s a simple banana bread recipe, but simple things in life are often the best don’t you think? Take one bite and you will be guaranteed to go back for more. Hopefully there will be at least some left when the family come home! You have noticed the size of the slices I cut here right? That was no accident trust me! 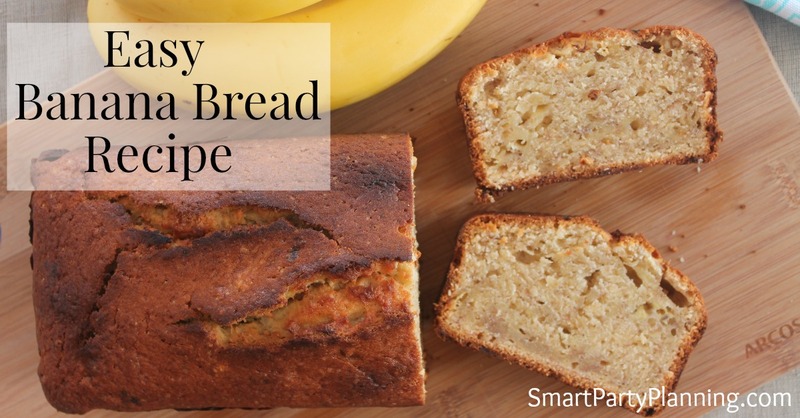 So are you ready for this easy moist banana bread recipe? Absolutely you are. Let’s get stuck in. Delicious, moist and fluffy banana bread. Easy to make and even easier to eat! Crush the bananas then add the eggs and vanilla essence. Mix together well. Add the dry ingredients to the banana's and mix well. This is also definitely the perfect cake to whip up if you are having guests over for afternoon tea. A big slice of banana bread with a hot cup of tea or coffee…yum. So if like me you are wanting to expand your taste buds horizons away from chocolate for once, but also need to have something simple, quick and delicious, this easy moist banana bread recipe is for you. So now you know all things cake is my weakness, what’s yours? Let’s stay in touch. Love the easy moist banana bread recipe? Sign up to the newsletter to be kept updated with more easy recipe, party and printable ideas, including access to the free printable library. You can also keep updated by following me on Pinterest. Hey, my Wonderful Wednesday Blog Hop goes live Tues eve 7pm ET. Would LOVE it if you’d stop by and share your posts. Thanks Sinea….it’s one of those banana breads that once you start….you can’t stop! Banana bread is one of my favorite quick breads. This one looks really yummy!! Thanks Dawn. I have to say that I am slightly addicted to this recipe. It’s far too easy to eat!! Love banana bread it is a favorite here – Thanks for linking up to Pin Worthy Wednesday, I have pinned your post to the Pin Worthy Wednesday Pinterest Board. Banana bread is very hit and miss here. Sometimes it disappears the moment its out of the oven and other times no one touches it. Thank you for linking up to this week’s Tasty Tuesday. I am pinning it to the Tasty Tuesday Pinterest board. This looks so incredibly moist. Thanks for sharing on the Creative K. Kids Tasty Tuesdays Linky Party. I hope you will join us again next week. Did you mean baking powder instead of baking soda? I made this and my bread didn’t rise. Oh noooo…so sorry Dee. Yes I did mean baking powder and I have now changed the recipe. Thanks for giving me the heads up! It says baking soda in the directions, and baking powder in the ingredients. So sorry Terri. It should read baking powder. Awesome recipe! Just FYI, “banana’s” means belonging to a banana, and “bananas” is the plural. Just popped a loaf in the oven! I’m excited to see how it turns out! I bake a lot and people r always asking me for a recipe. I have never had one that I used over and over! Let’s hope this will be the one!! Made this following the recipe and hard as a rock. Flour amount can’t be correct – 5 1/2 cups? did you find the recipe with 5 1/2 cups? Your right…this is far too much! You need to use 1 1/2 cups as written in the recipe above. I’m wondering if maybe you followed the recipe directly from Pinterest? For some reason, Pinterest is importing the recipe wrong…I don’t know why…and it’s nothing I have control over I’m afraid. I always recommend that you click through and follow the recipe from the blog rather than on Pinterest as then you know you are following the correct recipe. I hope you try it again following this recipe, as it really is yummy. I too made it with 5 1/2 cups and regretted it. I took it out early and am tossing it. Yes, Pinterest says 5 1/2 and in the ingredients above, it would be much clearer if there was a space between the 1 and the 1/2. It looks like 11/2 which translates to 5 1/2. What a waste! Oh well will try again when the bananas are around. So sorry to hear your banana bread didnt turn out right Joanne. The recipe however needs 1 1/2 cups of flour not 5 1/2 cups. If you try it again with the correct amount of flour then im sure you would love it. I hope you will give it another go. I only have 3 bananas,do i have to adjust the rest of the ingredients? Hi Mayleen. If you only have 3 bananas, I would go ahead and still use the same number of ingredients. It just might not taste as “bannary”….is that even a word?? Otherwise, maybe a quick run to the shops? I have been trying out a bunch of banana bread recipes recently. One called for 6 bananas for one loaf, it was tasty, but didn’t hit the mark. I tried yours since it calls for 4 (so many others call for only one! How can that be banana bread?) I didn’t pay super close attention to the directions, apparently. I opted to double the recipe and mashed 4 large and 3 small bananas. Creamed the butter and sugar, but when the sugar didn’t blend in fully, I thought I misread the amount of butter and actually DOUBLED the amount of butter. Then I added the banana/egg/vanilla mixture to the butter/sugar mixture which I thought was a mistake since it looked broken, like it didn’t blend fully. Then I added the flour/baking powder, mixed well, and poured into pans. Baked an hour. And ended up with the most flavorful, moist, light and amazing banana bread ever. sorry to bother you with a question 🙂 i tried your recipe with 3 bananas and i followed the recipe exactly except i used a mixer to cream the butter and sugar together, and then used it to combine the hand-mixed egg/vanilla/banana mixture and the flour/baking powder combo. i added the flour/baking powder a little at a time to fully incorporate. the result was kind of chewy? i was glad it wasn’t gooey like how some banana breads can be but i couldn’t figure out why it came out chewy. any thoughts? for some reason i can’t make a decent batch of banana bread so i’m sure it’s user error ha! Sorry to hear this banana bread didn’t work out for you. Your comment just made me think of an experiment that was once done with women making sponge cakes. They were all given the same recipe, cooked the cake in the same kitchen with the same ovens, same ingredients and every single cake turned out differently. How does that even happen? Anyway, in answer to your question….I am not really sure! I didn’t use a mixer on my banana bread, but I don’t think a mixer would affect that too much. However I am not a professional baker, so it’s not really an informed opinion! It is never chewy when I make it, far from it. I use 4 banana’s instead of 3, but again that’s all relative to how big bananas are which is never consistent. I’m sorry, I’m not really sure how to help. Could you maybe go for take 2 and not use the mixer to see how it comes out? I found this recipe and since I had 6 bananas that I would have tossed. But decided to make this Most Delicious Banana Bread I’ve had in forever! So simple, had all ingredients on hand. And baked in 60 min. I had 2 loaf pans,since I doubled the recipe. Excellent, can’t stop eating it !!!! Thank for for sharing this recipe.